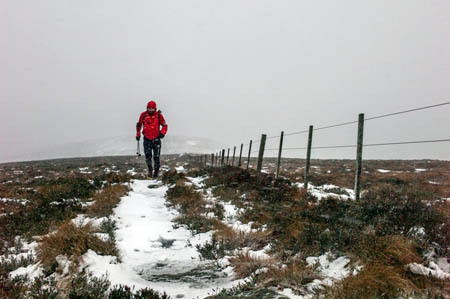 A mountain rescue team member has described the horrendous conditions as he accompanied the frontrunner in Britain’s most brutal race. 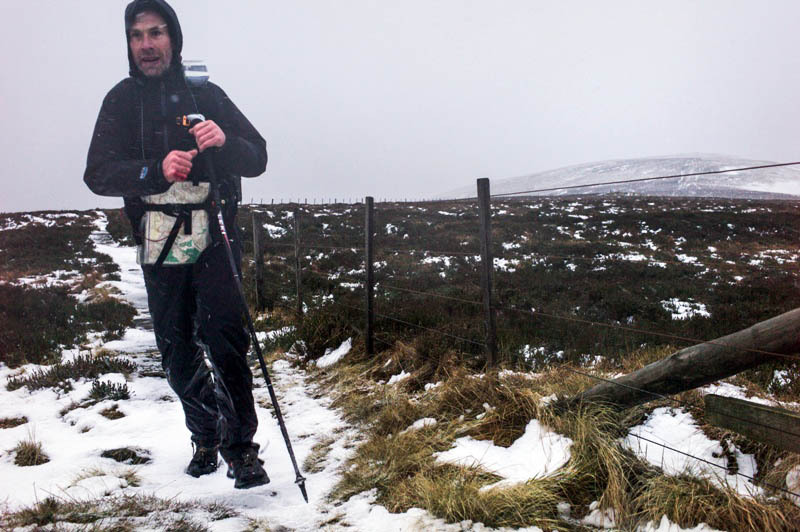 Damon Rodwell of Border Search and Rescue Unit, joined fellow Irishman Eoin Keith on part of the final stage of The Spine Race, as he neared the finish as Kirk Yetholm. A team spokesperson said: “This year’s event was hit hard by adverse weather, and the organisers were forced to impose mandatory stops at two of the checkpoints further south as storm-force winds and snow battered the competitors at various points of the route, which follows the Pennine Way from Edale in Derbyshire to Kirk Yetholm in the Borders. “The unplanned stops played havoc with pre-race strategies, and the huge early lead established by last year’s winner, Czech runner Pavel Paloncy, was dramatically reduced by a strong surge from Eoin Keith in the later stages. Mr Rodwell said: “Each runner carries a GPS tracker, which can be followed online. This has gained the race a huge world-wide following, with the event’s social-media profile exploding in the last two years. “I’d been watching the race develop over the course of the week, and took a run up to Lamb Hill Hut on Thursday to intercept Eoin. “The conditions I encountered up there were astonishing, possibly the most severe I’ve ever experienced. Battling head-down into the horizontal driving snow, I was incredulous to see Eoin approaching at a steady jog. “Admittedly he had the wind at his back, but the effect of the gusts on such uneven terrain is to continually knock you off balance. I ran with him for an hour or so to Windy Gyle, during which time we were both blown off our feet on numerous occasions. “After one of his tumbles, Eoin emerged from the bog with one of his poles snapped in half – the remaining jagged end making us uncomfortably aware how easy it would be to do the same to an arm or leg. These guys really are a breed apart. “Considering the fact that he had 250 hard miles in his legs from the previous four days, his resilience – both physical and mental – was extraordinarily. I gratefully turned around at Windy Gyle to retrace my steps back home to Hownam and met the chasing Pavel Paloncy a mile or so behind. Keith reached the finish 19 minutes ahead, but when the enforced stops were taken into account, he hadn’t done quite enough to wrest the crown from the relentless Czech. Third place went to Damien Hall, with the first three runners all finishing inside last year’s course record. Mr Rodwell said fourth place was captured by a stellar performance from Taunton’s Beth Pascall, whose clocking of 91 hours was 61 hours inside last year’s winning women’s time. Her demeanour in the Border Inn at the finish suggested that she’d done no more than stroll around the block, he said. Mr Rodwell added: “This race has the potential be a mountain rescue nightmare. “But meticulous organisation by an experienced team coupled with clever, unintrusive use of GPS technology and intelligent vetting of participants ensures that the risks are kept to a minimum. “Watching runners of all shapes, sizes and ages trundling over the line at the end of a week of relentless suffering over mountain-tops in the depths of a British winter was an inspiration. I know the main concern, quite rightly, of both the MR teams covering this race, and i presume of your magazine's readers, is safety. However, it is still a competitive race with winners and losers. Eoin Keith didnt win, but if he had, I for one would have been questioning whether having a non-competitor run with him for an hour wasnt gaining him an unfair advantage.